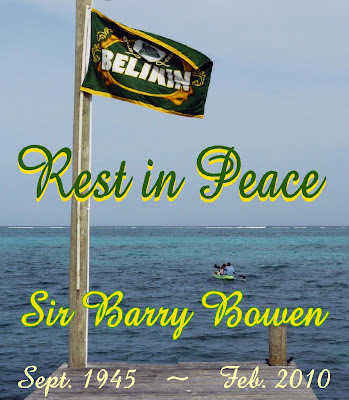 « Older: Tragic news tonight – Sir Barry Bowen is dead at 64. Bottling magnate Sir Barry Bowen died last night when the private plane he was piloting crashed south of San Pedro Town on Ambergris Caye. Reports are that the 64 year old Bowen was flying to his home in San Pedro with four other passengers. The other passengers are reported to be employees of Bowen and were school teachers at the Gallon Jug school. The couple, along with their two small children also perished. The plane crashed within range of the San Pedro Municipal Airport in a marshy area a fair distance south of the airstrip. An experienced pilot, Bowen has been flying for over 40 years. The plane was a Cessna 272 with a turbine engine. Similar to the ones used by the small airlines. Sir Bowen was a prominent businessman, developer, bottling magnate and one of Belize’s wealthiest men. His company, Bowen and Bowen Bottling Works owns Belikin Beer, Guinness Stout and Coca Cola, Fanta, Sprite and Crystal Water bottling operations. Bowen and Bowen company was started by his father in the 1930s. Barry Bowen bought the company from his father in 1978. Bowen is survived by his five children; four sons, one daughter and his wife, Dixie.